The Hike to Hawkeye Peak is one of the gems within the incredible Goat Rock Wilderness. Try to do this hike in Mid-July as the flowers are unbelievable. The trail to Hawkeye is the same trail and trail head to Goat Lake. It is located at the end of Forest Road #2150 near Chambers Lake. Actually, the first 5 miles of this hike are the same as the first 5 miles of the hike to Goat Lake. 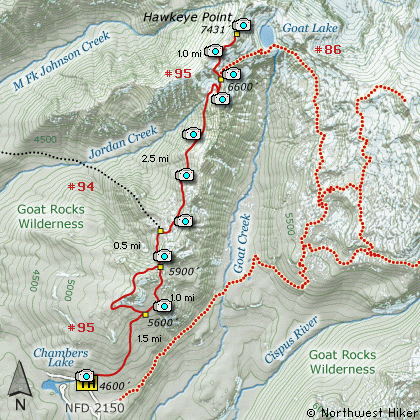 This hike to Hawkeye Peak follows Trail #95 north along Goat Ridge. The trail head is not the same as the trail head to Snowgrass Flats. Follow the signs carefully when you park. The trail begins a very steep climb immediately, and continues to do so for the first couple miles. Actually, you are given the opportunity to do a loop around the Goat Ridge Lookout Trail, but on this hike, I'd recommend just getting to Hawkeye Peak and back, so stay to the right as you pass Trail #95A. Eventually, you will meet the same trail again at the other end of it. Just keep on Trail #95 heading north. At about 2.5 miles you will past the Jordan Creek Trail #94. Keep straight ahead, climbing again and crossing a small stream, which could be a problem in early summer. All along this trail you will be treated to wildflower displays. The closer you get to Goat Lake the better the displays. At about 4.5 miles you will climb up into a really neat circ. You will be out in the open from now on. Switchbacking your way up the east side of this area will bring you to a saddle between the two valleys and to the Lily Lake Trail #86. Follow Trail #86 as it will take you up the ridge you will need to climb to get to Hawkeye Peak. The trail climbs steeply through open meadows of incredible wildflowers (in season). As you climb along Trail #86, the views just keep getting better and better. Actually, they are so breath-taking it is difficult to describe. At about another half mile the trail reaches to top of the ridge which you will need to follow to climb Hawkeye Peak. At this point you are treated to fabulous views to the north, including Mt. Rainier. Looking up the ridge to the east of you, you can see a users trail quite clearly. Follow this trail to the top of the first summit just in front of Hawkeye Peak. When you reach this first summit, watch carefully for mountain goats as they are plentiful in this area. Now descend just a bit to the pass that separates you from Hawkeye and then make the last steep climb to the top. As you crest the southern flank of Hawkeye, you will be able to see Goat Lake far below you. Again, keep you eyes open for mountain goats. As you reach the top of Hawkeye Peak, you will be rewarded with even more views, but now to the northeast. With great caution you can explore the area around the top of Hawkeye as it will provide you with even more outstanding vistas. Travel east on US Hwy 12 for about 48 miles to Randle. From Randle travel east on US Hwy 12 for about 13.3 miles to the junction with Forest Road 21. Turn right (south) onto FR21 and follow it uphill for about 5 miles. At this point you will see Forest Road 2110 on your left, which is the road to the Glacier Lake trailhead, but you continue straight ahead on FR21. In another 8.1 miles you will come to the junction of Forest Road 2150. Bear left onto FR2150 and follow it about 3 miles and you will pass the junction on your left which leads to the Chamber Lake campground. Continue ahead just a short distance, on what is now called FR 040 to what is referred to as the Berry Patch trailhead. This hike and many more begin here.